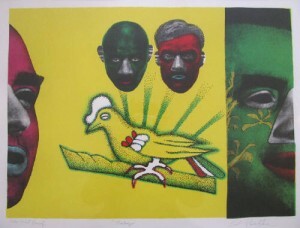 Ed Paschke was born in 1939 in Chicago. As a student at The School of the Art Institute of Chicago he was influenced by many artists featured in the Museum’s special exhibitions, in particular the work of Gauguin, Picasso and Seurat. Although Paschke’s interests leaned towards representational imagery, he learned to paint based on the principles of abstraction and expressionism. 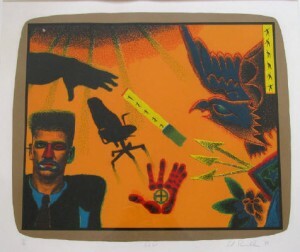 Paschke received his Bachelor of Fine Arts degree from The School of the Art Institute of Chicago in 1961, and his Master of Fine Arts degree from The School of the Art Institute of Chicago in 1970. Between his graduate and undergraduate work Paschke traveled and worked a variety of jobs amassing the experiences that would shape his artistic style. During a brief period in New York, he was exposed to Pop Art philosophy and began to incorporate elements of this style borrowing images directly from the print media and other elements of popular culture. Themes of violence, aggression, and physical incongruity prevail in his work of this period. Returning to Chicago in 1968 he exhibited with other artists whose work, like Paschke’s, tapped outsider art and Surrealism as source imagery and employed brilliant color throughout a busy and carefully worked surface. Known collectively as the Imagists, their work attracted attention both regionally and nationally. 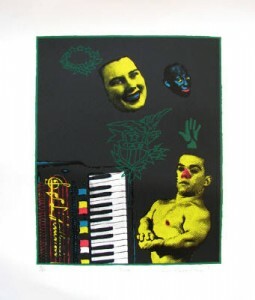 Paschke then departed from Pop’s exuberant primary colors; his palette was and remained both darker and more psychedelic, spanning from fluorescent neon’s to garish, sickly hues. Paschke’s work of the 1970’s reflects society’s subculture as the artist replaced images from the print media with images derived from the electronic media. Paschke enlarged the scale to a grand proportion and included images of such well-known figures as George Washington, Elvis Presley, and Mona Lisa. His work reveals a powerful interaction between humanity and technology capable of shaping perception at the most fundamental level. Paschke’s late works veered back to abstraction, and in them military iconography (guns, insignias) is juxtaposed with Eastern religious motifs and brightly tinted facial features rendered in isolation. In Legal Tender (2004), a hat of the sort worn by commissioned officers in the armed forces tops an outline of a nose, at once suggesting a face and, in conjunction with cartoonish birds in the lower corners and horizontal lines spanning the painting’s top edge, denying human presence. The heavily lidded eyes, large nose, and full lips pictured in Bang Bang (2004) also hint at, but don’t cohere as, a discrete identity, and the work’s mix of whimsy (its biomorphic yellow underpainting) and menace (the title phrase, which is superimposed on the mouth) encapsulates the combination of pictorial precision and moody allusion that marked Paschke’s production.